As a judge ordered that the National Football League lockout go back into force, the NFL Draft was still held to remind the millions of diehard football fans throughout the United States of America that even when owners and players are fighting over money, the beat goes on. This weekend, for the 76th time in history, the NFL Draft was held. The first round began Thursday night at Radio City Music Hall in New York City in Rockefeller Center. Every year the draft garners much attention from fans of the sport. Men and women watch anxiously to see who their team will take. Other’s watch to see when and where a friend or family member will get drafted if they are even selected at all. And of course there are the hundreds of players who tune in and wait by their phones to find out where they will be playing come fall. The weekend is full of excitement and disappointment. Fans end up either loving their draft day success or questioning their favorite team and their management. Players see their stock rise while others see it fall. However, if anything can be learned from the top pick busts of JaMarcus Russell and the late round success stories of Tom Brady, at the end of the day it is the player who dictates their own success. 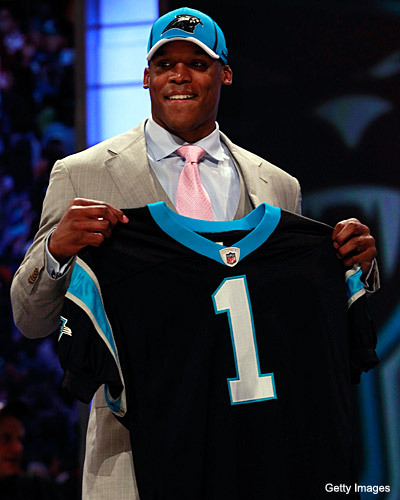 The big name in the 2011 draft was Cam Newton of Auburn. The highly scrutinized quarterback became the number one overall pick as the Carolina Panthers drafted him immediately. Newton’s teammate and standout defensive player Nick Fairley was taken by the Detroit Lions. The former Heisman Trophy Award winner Mark Ingram of Alabama was taken late in the first round by the New Orleans Saints. The top twelve selections saw four quarterbacks get chosen with the most appealing choice being by the Tennessee Titans who took Jake Locker of Washington to hopefully groom him to replace Vince Young. The draft was also a testamate to the strength of the SEC in college football. Five of the first six players selected played in the Southeastern Conference. But with the lockout still going on, it is unclear if any of the draft matters. If no resolution is agreed to in the coming months, none of these players will get signed and thus will not be able to lace up their cleats this upcoming fall to begin what should be the beginning of their dreams coming true.